Back after a lovely long Christmas break and ready to get cracking, today we began our lesson by recapping on all the work we’d done in our sessions in December. Architects always do a lot of research on the existing before beginning to work on the new, and it’s important to record everything in one place in order to be organised and to inspire ideas. We blew up some existing school plans – provided to us by the school principal Ms Daltan – to a large scale, so that everyone would have enough room to mark down all their observations about each space in the building. 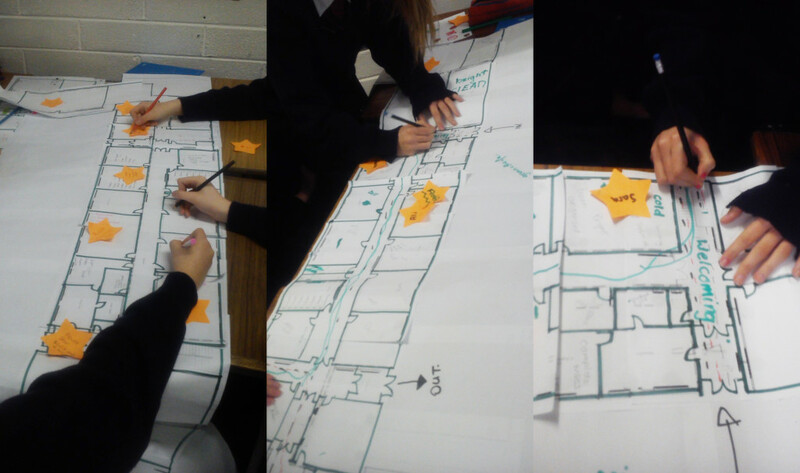 The girls worked in three groups to fill the plans in with the types of materials, the light, the colours and sizes, the uses of each space, and the feelings that each of these aspects bring when the spaces are used. For example, it was generally agreed that the rooms in the front of the building receive much more light (sometimes too much!) while the rooms at the back are dark and a lot colder. We ended up with some fantastic drawings full of clever observations, a great place to start thinking about how spaces in the school could be changed to make a nicer place to learn in. Workshop day! Time to roll up our sleeves, pick up those pens and get creating. Today we had a whole morning together, loads of time to get the creative juices flowing and get down to some serious designing! We began our workshop by looking again at the collection of images that the girls had chosen way back on the first day we worked together. We had a little chat about unconventional buildings like the Underwater Hotel and the Spherical Treehouses and asked some questions about why most buildings we live and work in don’t look like this. From the research the girls had done, it’s become clear that not all buildings have to look the same, have to have straight lines and boring colour schemes….that there is no limit to what’s possible when designing. To help with a little inspiration, I found some images of schools and offices that prove the conventional image of “learning” and “working” spaces is changing. The German “Kindergarten die Katze” by artist Tomi Ungerer and architect Ayla-Suzan Yöndel shows that schools don’t have to rectangular. The students go in to school through the cat’s mouth and come out down a slide in the cat’s tail! Some other lucky students get to attend the Public School and Primary CEIP Roldan, by the Spanish architecture firm Estudio Huma. At first glance this school looks like it’s painted but when you look more closely you can see it’s made of grass! And why not? Imagine being able to plant flower seeds on the walls of your school? In that way it would look different at all times of the year! Some other spaces we looked at were the offices at Google and Innocent Smoothies, which have slides instead of stairs, egg-shaped cocoons where you can go and have a rest or do some work on your own, and ping pong tables and couches to have fun and relax during your breaks. Some of the girls were a little apprehensive about how to represent their ideas so we looked at some examples of sketches, models, collages and diagrams made by students in the “A Space For Learning” projects (http://aspaceforlearning.blogspot.ie/) and also at the useful “How To” and examples in their Design Journals. To show that there was no need to be worried about accuracy and artistic ability I showed the girls how this architect’s sketch became this building! A good place to start creating is by brainstorming. Each group took a large piece of paper and some pens. They agreed on a place in the school they’d like to redesign and wrote it in the middle of the page. We set some ground rules: that everyone in the group would contribute, that ALL ideas were to be written down, and most importantly that there was no such thing as a stupid idea! The results were pretty interesting, with some really fun ideas alongside some very practical and useful ones. Each group then took a vote on their favourite idea, or a combination of a few of the ideas they had come up with, to explore further. Time to get building! The girls did some really great work measuring and making rooms out of card, choosing colour schemes, designing furniture and thinking about how the spaces would be used. The end results speak for themselves! Have a look at some work in progress photos below. A great day’s work by all, the models are currently being displayed for the rest of the school to see. 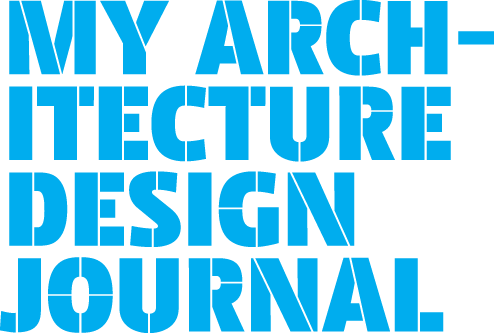 This week we are going to present our work to date at the Architects in Schools Colloquium in IMMA. Looking forward to seeing you there!